Good Morning & Happy Passover and Easter Everyone!! I've been super sick with the flu for the past few days, so this weeks #DessertDiva post is a tad late, as well as skimpy. Please forgive me, I just didn't have the energy to do a full shoot, and write out the recipe. I feel somewhat better today, which is good because tomorrow I'm going to spend the day with my amazing family, at my brother's house in Harpers Ferry, WVA. His house is literally at the top of a mountain, with the most beautiful view. I'll definitely take pictures to show you guys, along with the litter of baby piglets he has. They're the cutest little things! Anyway, back to the yummies I have for you guys. This week I took a ride on the healthy side, with a homemade yogurt #parfait. It's layers or raspberry yogurt, fresh sliced, strawberries , blackberries, whipped cream, and chunks of a @nutshell_co granola bar in between, to give it some crunch. That extra texture takes it from fantastic, to absolutely amazing. It didn't come out as pretty as I had in mind. See I found out that when I feel like crap, my patience goes right out the window, thus I had none left to make it look as amazing as it tastes! Making yogurt isn't as hard as I thought it would be. What's your favorite yogurt? Do you like it with or without toppings? Also I'd love to hear some ideas of what you guys would like me to do upcoming #DessertDiva posts on. I'm always looking for new ideas. Have a wonderful holiday no matter what you celebrate!! Yummy! This looks like a delicious parfait, I love parfaits! :) Thank you so much for sharing this tasty and healthy recipe. Hmm this looks like a great treat. I love the presentation. 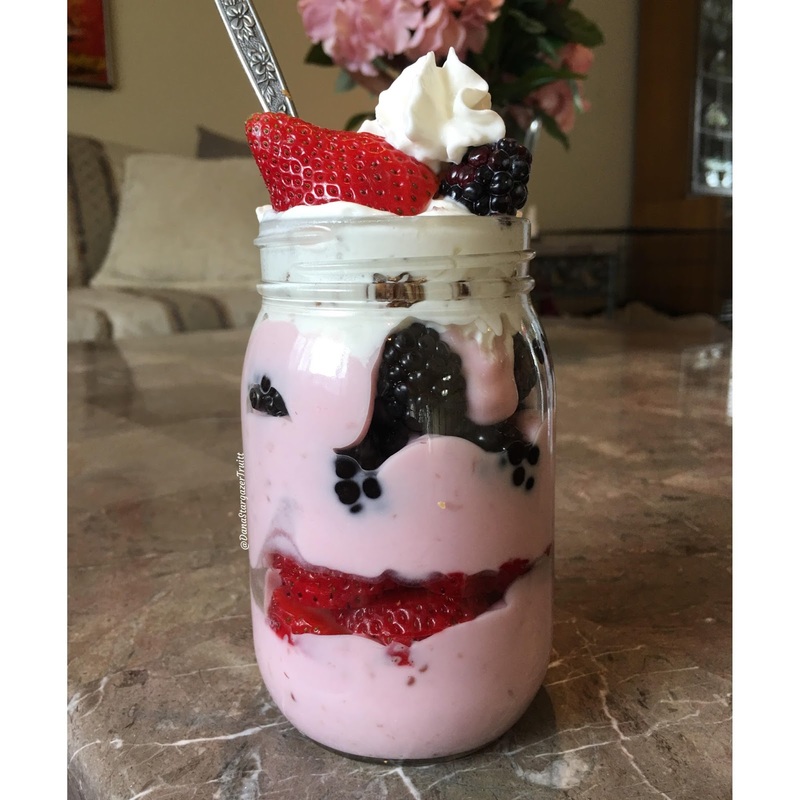 What a fantastic looking parfait and it has to be healthy too.I am happy to find this recipe.Thanks so much for the recipe. Awhhh me too, it's the best way to eat something sweet without all the extra sugar and junk!! Your yogurt parfait looks delicious! I used to make yogurt many years ago when my parents moved in, and they ate it all the time. Somewhere along the way I got out of the habit of making it. I loved my yogurt maker. Now I buy Greek yogurt with the fruit already in it. But yours looks so much better! Ohhhh you have a yogurt maker? That's sounds amazing ...who makes it, and is it easy to use? I gotta get me one!! Yummmm! Your yogurt parfait looks divine! That looks like a yummy and healthy dessert. Hope you're feeling better. This look so yummy. I love strawberry. Blackberries go so well with them too. I usually don't put any toppings on my yogurt. My husband does though!